Regular readers know that we have reverse proxy of IPv6 for this website. It is Probably Common to Ask How to Use Domain Name Instead of IP Address to SSH. It is Complicated When Your Domain Has Multiple Servers, Like For Reverse Proxy. It depends on your current computer’s IP for setup like ours. For dedicated servers, possibly you have more IP v4 addresses to SSH and face traffic. Obviously, we can only discuss most simply setup – one server, one IPv4, computer uses IPv4, you have some paid DNS service like Rage4 DNS or DynDNS. Dyn was cost effective once (before change in their ownership). Now, Rage4 like DNS actually more cost effective and also fast like Dyn. DNS system itself highly complicated. DNS servers provided by their ISP indicates IP with domain name in the /etc/resolv.conf file. First, make sure that you have met the above points as requirement. We can not say about web host’s DNS services. Web host’s DNS may block SSH with domain name, they usually provide simply a cheaper system to point your domain. Premium DNS, even free standalone Hurricane Electric DNS has clear cut control of operations. We need the above clearly defined localhost and domain name with IP. Apache2 HTTPD web server actually warns if FQDN not present. DO NOT modify that on server without thorough research and test on development server. That is not easy, safe work. This Article Has Been Shared 9145 Times! Here Are Useful, Regularly Updated Day to Day Commands For Server, This is Specially Written For Cloud Server Administration or VPS Instance. Here is How To Configure Fail2Ban With Mod Security & Others On Apache Server To Protect From PHP And Other Exploits. Config Files Included. TICK Stands For Telegraf, InfluxDB, Chronograf, Kapacitor. Here is How To Install TICK Stack on Ubuntu, CentOS For System Metrics Monitoring. 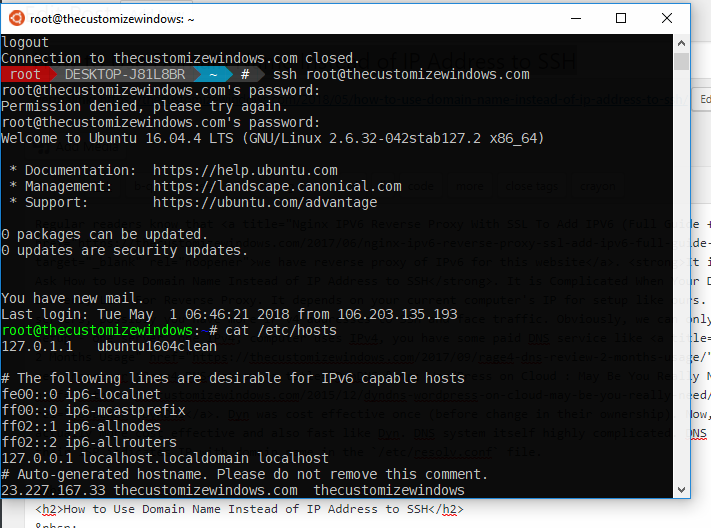 Cite this article as: Abhishek Ghosh, "How to Use Domain Name Instead of IP Address to SSH," in The Customize Windows, May 1, 2018, April 23, 2019, https://thecustomizewindows.com/2018/05/how-to-use-domain-name-instead-of-ip-address-to-ssh/.